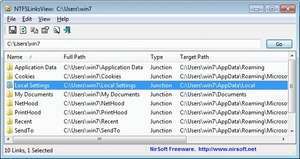 NTFSLinksView is a nifty little utility which can display a list of Windows symbolic links, even if they aren't visible in Windows Explorer. This application is both lightweight and very easy-to-use, as well as portable. NTFSLinksView's main layout is list-based, quite similar to some iterations of Windows Explorer. From the list, you can right-click the items and perform a few commands including viewing the properties of the target. Version 1.30 is a freeware program which does not have restrictions and it's free so it doesn't cost anything. For security reasons, you should also check out the NTFSLinksView download at LO4D.com which includes virus and malware tests. Additional screenshots of this application download may be available, too. NTFSLinksView download been highly rated by our users.